The small caps posted only a minor gain despite the 269-point Dow rally. This was a big cap short squeeze thanks to Disney, JP Morgan, Goldman Sachs and Boeing. They added 250 Dow points of the 269-point gain. 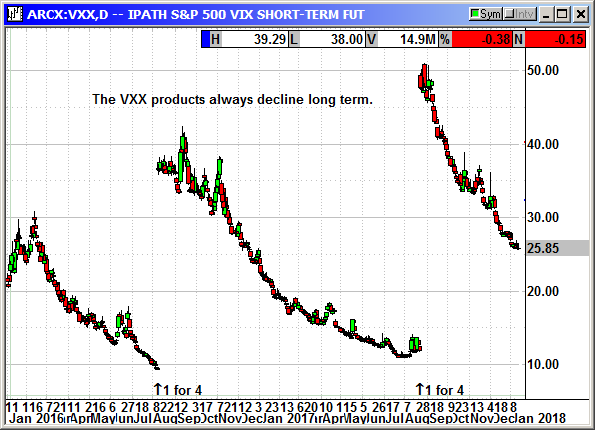 The small cap A/D line was almost 2:1 in favor of advancers but the individual stock gains were minimal. 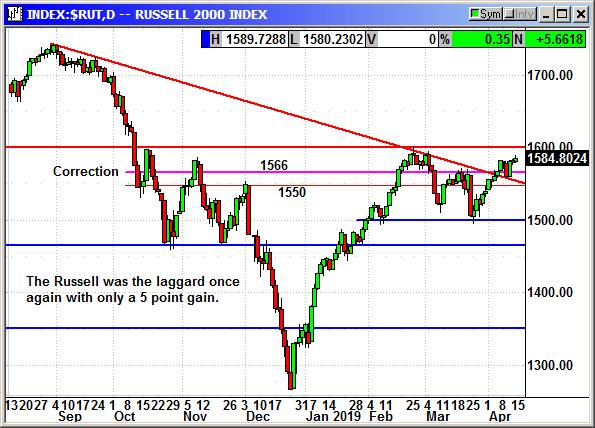 However, with the S&P only 23 points from a new high the market path is likely to be higher at least in the short term. Eventually there will be some price chasing on the small caps and hopefully that will not trigger the climax top. The long position was stopped at $4.85. No specific news. New 7-month closing high. Original Trade Description: April 5th. Cypress Semiconductor Corporation designs, develops, manufactures, markets, and sells embedded system solutions worldwide. It operates in two segments, Microcontroller and Connectivity Division, and Memory Products Division. The Microcontroller and Connectivity Division provides microcontroller (MCU), analog, and wireless and wired connectivity solutions, including Traveo automotive MCUs; programmable system-on-chip and general-purpose MCUs; analog power management integrated circuits and energy harvesting solutions; CapSense capacitive-sensing controllers; TrueTouch touchscreens; Wi-Fi, Bluetooth, and Bluetooth low energy; and USB controllers comprising solutions for the USB-C and USB power delivery standards, as well as wireless Internet of things connectivity solutions. The Memory Products Division provides NOR and NAND flash memories, static random access memory (SRAM) products, HyperRAm, synchronous and asynchronous SRAMs, nonvolatile SRAMs, F-RAM ferroelectric memory devices, and other specialty memories and clocks. The company serves various markets, including automotive, industrial, consumer, computation, white goods, communications, handset, PC peripherals, mobile devices, networking, telecommunications, video, data communications, computation, and medical markets. 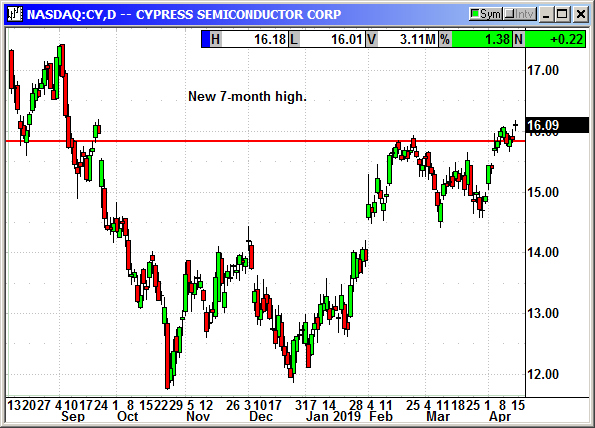 Cypress Semiconductor Corporation sells its semiconductor products through distributors and manufacturing representative firms, as well as through sales force directly to original equipment manufacturers and their suppliers. The company was founded in 1982 and is headquartered in San Jose, California. Company description from FinViz.com. Cypress makes chips for the Internet of Things or IoT. That has evolved into automotive uses as well as today's cars are connected to the internet in multiple ways. Self-driving cars obviously have more chips but many cars today function as their own WiFi hotspot for the occupants. I am sure the explosion of IoT devices we have seen over the last several years is just the tip of the iceberg for the years to come. Shares spiked in early February after the company reported earnings of 35 cents compared to estimates for 33 cents. Revenue of $604.5 million also beat estimates for $599 million. After several days of gains the stock rolled over with the chip sector in early March. Over the last several days shares have rallied to close at a 6-month high on Friday. More than 7,800 of these calls were bought on Friday compared to an open interest of only 257. Somebody is betting a lot that the stock will go up. Because of the cheap price we may hold over earnings unless we have a decent profit to protect before they report. We will NOT hold the stock over the earnings. Long CY shares @ $15.90, see portfolio graphic for stop loss. Optional: Long May $17 call @ 40 cents, see portfolio graphic for stop loss. No specific news. Shares closed at a 2-month high. Original Trade Description: April 3rd. Inovio Pharmaceuticals, Inc., a late-stage biotechnology company, focuses on the discovery, development, and commercialization of DNA-based immunotherapies and vaccines to prevent and treat cancers and infectious diseases. Its SynCon immunotherapy design has the ability to break the immune system's tolerance of cancerous cells, as well as is intended to facilitate cross-strain protection against known, as well as new unmatched strains of pathogens, such as influenza. The company is involved in conducting and planning clinical studies of its proprietary SynCon immunotherapies for human papillomavirus-caused pre-cancers and cancers; bladder cancer; glioblastoma multiforme; hepatitis B virus; hepatitis C virus; human immunodeficiency virus; Ebola virus; middle east respiratory syndrome; and Zika virus. Its partners and collaborators include MedImmune, Limited; The Wistar Institute; University of Pennsylvania; GeneOne Life Science Inc.; ApolloBio Corporation; Regeneron Pharmaceuticals, Inc.; Genentech, Inc.; Plumbline Life Sciences, Inc.; Drexel University; National Institute of Allergy and Infectious Diseases; United States Military HIV Research Program; U.S. Army Medical Research Institute of Infectious Diseases; National Institutes of Health; HIV Vaccines Trial Network; Defense Advanced Research Projects Agency; the Parker Institute for Cancer Immunotherapy; and Coalition for Epidemic Preparedness Innovations. Inovio Pharmaceuticals, Inc. was founded in 1979 and is headquartered in Plymouth Meeting, Pennsylvania. Company description from FinViz.com. Inovio is developing new cancer treatments that deliver coded DNA to cells so they can create their own antibodies against the invading cancer cells. They have multiple trials in progress and the success of any one trial will catapult INO significantly higher. The drawback is money. They ended the year with $85.5 million after burning through $69 million in 2018. In February they announced a secondary to raise another $82 million. The secondary was convertible notes at $5.38 in 2023. Since that is almost a slam dunk deal, investors trashed the stock because of the 17% dilution in 2023. I think that is very short sighted since we could see three years of stock gains before that comes to pass. After crashing to $3.30 on the secondary announcement shares have started to rebound. Wednesday's close was a two-month high. They announced the early closing for enrollment on two different cancer trials. They also announced a new therapy against respiratory tract tumors in a new study. Good things are breaking out all over. Buy INO shares, currently $3.86, stop loss $3.55. Optional: Buy May $4 call, currently 35 cents, no stop loss. No specific news. Resistance holding. Pure Storage, Inc. engages in building a data platform that enables businesses to enhance performance and reduce complexity and costs worldwide. The company delivers its data platform through Purity Operating Environment, an optimized software for solid-state memory that offers enterprise-class storage and protocol services; FlashArray and FlashBlade optimized hardware products for solid-state memory to enhance the performance and density of flash, optimize its advanced software services, and reduce solution cost for customers; Pure1, a cloud-based management and support software; and FlashStack and Artificial Intelligence Ready Infrastructure converged infrastructure solutions. Its data platform is used for a range of use cases, including database applications, large-scale analytics, artificial intelligence/machine learning, private and public cloud infrastructure and webscale applications, virtual server infrastructure, and virtual desktop infrastructure; and helps customers scale their businesses through real-time and accurate analytics, increase employee productivity, improve operational efficiency, and deliver compelling user experiences to their customers and partners. The company serves enterprise and commercial organizations, cloud, global systems integrators, and service providers across various set of industry verticals, consumer web, education, energy, financial services, governments, healthcare, manufacturing, media, retail, and telecommunications through a network of distribution and channel partners. The company was formerly known as OS76, Inc. and changed its name to Pure Storage, Inc. in January 2010. Pure Storage, Inc. was founded in 2009 and is headquartered in Mountain View, California. Company description from FinViz.com. Their memory management products are state of the art and their acquisition of Compuverde will increase those capabilities. Compuverde is a leading developer of file software solutions for enterprises and cloud providers. The combination of the two companies will allow customers to implement true hybrid architectures in on premise or cloud applications or a mix of both. They reported earnings of 14 cents that missed estimates for 19 cents. However, the miss was due to a breakdown at a contract manufacturer and prevented them from shipping a large number of orders. Revenue still rose 24% to $422.2 million despite missing estimates for $443 because of the supplier breakdown. Shares dipped on the initial earnings results but have rebounded to six month high. 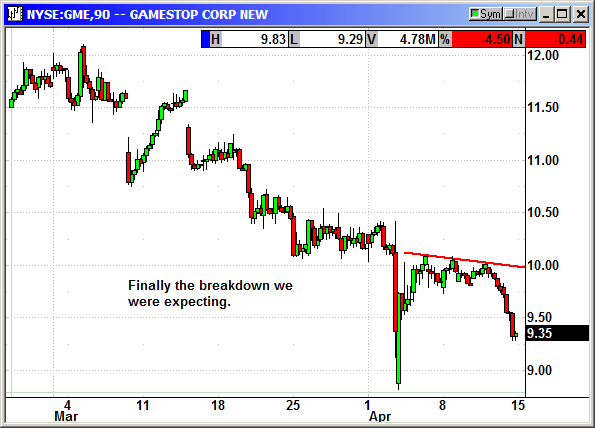 Shares have been consolidating for the last six days but appear to be ready for a breakout. 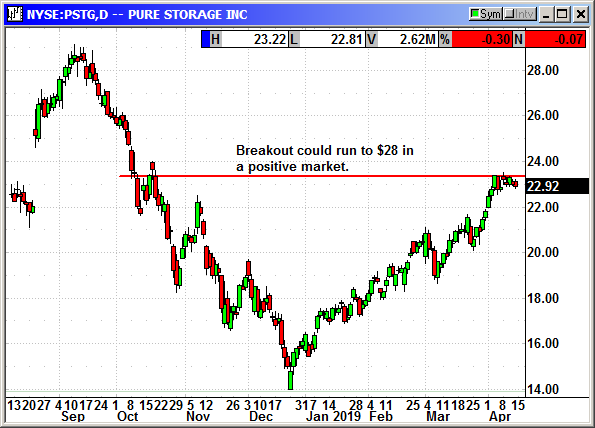 Long PSTG shares @ $23.40, see portfolio graphic for stop loss. Optional: Long May $25 call @ 40 cents, see portfolio graphic for stop loss. No specific news. Shares are holding over prior resistance at $8. Original Trade Description: March 30th. Vipshop Holdings Limited operates as an online discount retailer for various brands in the People's Republic of China. It operates in two segments, Vip.com and Internet Finance Business. The company offers women's apparel, such as casual wear, jeans, dresses, outerwear, swimsuits, lingerie, pajamas, and maternity clothes; men's apparel comprising casual and smart-casual T-shirts, polo shirts, jackets, pants, and underwear; women and men shoes for casual and formal occasions; and accessories that include belts, jewelry, watches, and glasses for women and men. It also provides handbags, which comprise purses, satchels, duffel bags, and wallets; apparel, gears and accessories, furnishings and decor, toys, and games for boys, girls, infants, and toddlers; sports apparel, sports gear, and footwear for tennis, badminton, soccer, and swimming; and consumer electronic products, including computers, mobile handsets, digital cameras, and home appliances. In addition, the company offers skin care and cosmetic products, such as cleansers, lotions, face and body creams, face masks, sunscreen, foundations, lipsticks, eye shadows, and nail polish; and home furnishings comprising bedding and bath products, home decors, dining and tabletop items, and small household appliances. Further, it provides designer apparel, footwear, and accessories; and snacks and health supplements, and occasion-based gifts. Additionally, the company offers Internet finance services, which comprise consumer and supplier financing, and wealth management services. It provides its branded products through its vipshop.com, vip.com, and lefeng.com online platforms, as well as through its cellular phone application. Additionally, the company offers warehousing, logistics, procurement, research and development, consulting, and software development and information technology support services. Vipshop Holdings Limited was founded in 2008 and is headquartered in Guangzhou, the People's Republic of China. Company description from FinViz.com. In late February, the company reported earnings of 19 cents that beat estimates for 18 cents. However, revenue of $3.80 billion missed estimates for $3.96 billion. The 8.1% rise in revenue was down from a 16.4% rise in the prior quarter. The CEO said the weak quarter was the result of the company shifting some low margin categories from the "first-party business" and into the "marketplace platform." He said the move would result in a positive improvement in earnings beginning next quarter. For the current quarter they were only targeting 1-5% revenue growth and analysts were expecting 11.6%. The CEO cautioned that revenue growth was not the metric to worry about. The company is now focused on increasing profits rather than increasing revenue at any cost. Zacks reiterated a buy rating saying earnings estimates had risen 5.9% over the last 60 days which includes the post earnings commentary. VIPS only has a 9.7 PE compared to 29.4 for the rest of the industry. After the Zacks comments on the 25th the stock began escalating sharply and closed at an 8-month high on Friday. The stock is now over the 50, 100 and 200 day averages. 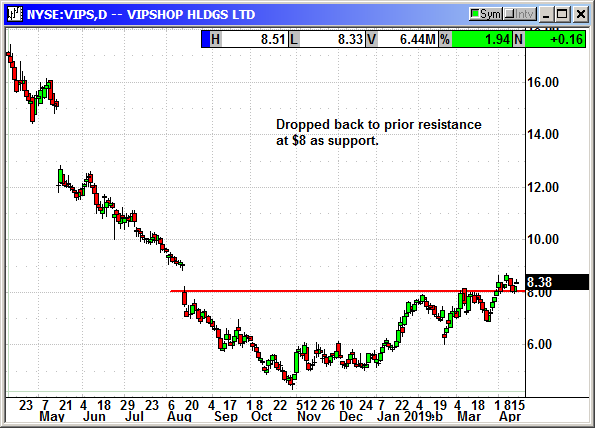 Long VIPS shares @ $8.19, see portfolio graphic for stop loss. Optional: Long August $9 call @ 75 cents, see portfolio graphic for stop loss. No specific news. Shares fell below support at $5 to stop us out. 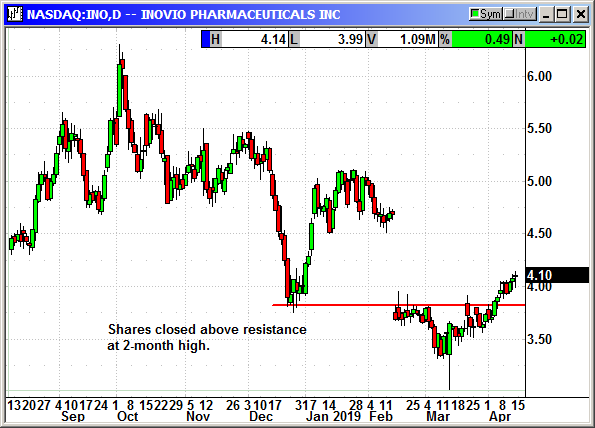 The biotech sector has been very weak over the last several days. Original Trade Description: March 13th. Intrexon Corporation engage in the engineering and industrialization of biology in the United States. The company, through a suite of proprietary and complementary technologies, designs, builds, and regulates gene programs, which are DNA sequences that consist of key genetic components. It provides reproductive technologies and other genetic processes to cattle breeders and producers; biological insect control solutions; technologies for non-browning apple without the use of artificial additives; genetically engineered swine for medical and genetic research; commercial aquaculture products; and preservation and cloning technologies. The company also offers UltraVector platform that enables design and assembly of gene programs that facilitate control over the quality, function, and performance of living cells; and RheoSwitch inducible gene switch that provides quantitative dose-proportionate regulation of the amount and timing of target protein expression. In addition, it provides AttSite Recombinases, which allows stable, targeted gene integration and expression; LEAP automated platform to identify and purify cells of interest, such as antibody expressing cells and stem cells; ActoBiotics platform for targeted in situ expression of proteins and peptides from engineered microbes; and AdenoVerse technology platform for tissue specificity and target selection. The company serves the health, food, energy, and environment markets. Intrexon Corporation has collaboration and license agreements with ZIOPHARM Oncology, Inc.; Ares Trading S.A.; Oragenics, Inc.; Intrexon T1D Partners, LLC; Intrexon Energy Partners, LLC; Intrexon Energy Partners II, LLC; Genopaver, LLC; Fibrocell Science, Inc.; Persea Bio, LLC; OvaXon, LLC; S & I Ophthalmic, LLC; Harvest start-up entities; and others. The company was formerly known as Genomatix Ltd. and changed its name to Intrexon Corporation in 2005. Intrexon Corporation was founded in 1998 and is based in Germantown, Maryland. Company description from FinViz.com. Intrexon reported a loss of 22 cents that beat estimates for 29 cents. Revenue of $43.2 million declined 44% and missed estimates for $62 million. It was not a good report. The company's primary revenues come from collaboration and licensing along with some product and service revenues. Collaboration and licensing revenues declined 55% to $25.2 million. These revenues can be very sporadic which means some earnings reports can be ugly. However, the auditor is considering a "going concern" statement in the financials. The company has $224 million in cash on hand and multiple streams of cash flow from these collaboration and licensing efforts. The CEO said there were multiple efforts underway to develop new revenue streams. Last week, Bill Miller, of Miller Value Partners, a $2 billion investment fund, tweeted that current efforts underway could make the company worth many multiple of the current stock price. Shares began to rebound from the post earnings beating. On March 8th, AquaBounty (AQB) a wholly owned subsidiary of XON, received permission from the FDA to import fish eggs from Canada and raise salmon in Indiana. I do not understand what is special about these eggs but shares of AQB spiked sharply. I am recommending we follow Bill Miller and see if this inexpensive stock can at least return to the pre earnings levels. Update 3/20: Subsidiary AquaBounty (AQB) priced a secondary offering of 3,345,282 shares at $2.25 per share to raise $7.5 million. This has no impact on XON. 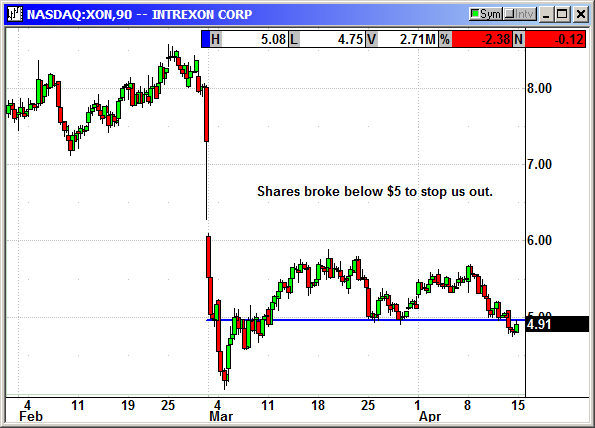 Closed 4/12: Long XON shares @ $5.61, exit $4.85, -.76 loss. 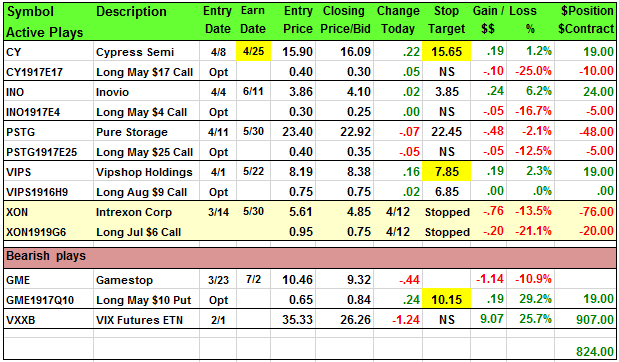 Closed 4/12: Long July $6 call @ $.95, exit .75, -20 cent loss. No specific news but shares finally broke down as we expected. Next stop $7. Original Trade Description: March 23rd. GameStop Corp. operates as a multichannel video game, consumer electronics, and wireless services retailer. It operates in five segments: United States, Canada, Australia, Europe, and Technology Brands. The company sells new and pre-owned video game hardware; video game software; pre-owned and value video games; video game accessories, including controllers, gaming headsets, virtual reality products, memory cards, and other add-ons; and digital products, such as downloadable content, network points cards, prepaid digital and prepaid subscription cards, and digitally downloadable software. It also sells wireless products, services, and accessories; collectibles, such as licensed merchandise primarily related to the video game, television, and movie industries, as well as pop culture themes; gaming-related print media, and mobile and consumer electronics products; PC entertainment software in various genres comprising sports, action, strategy, adventure/role playing, and simulation; and carry strategy guides, magazines, and interactive game figures. In addition, the company operates e-commerce sites under the GameStop, EB Games, Micromania, and ThinkGeek brands; collectibles stores under the Zing Pop Culture and ThinkGeek brands; and Spring Mobile, an authorized AT&T reseller operating AT&T branded wireless retail stores. Further, it provides Game Informer magazine, a print and digital video game publication; and operates Simply Mac, an authorized Apple reseller that sells Apple products, including desktop computers, laptops, tablets and smart phones, and related accessories and other consumer electronics products, as well as training, warranty, and repair services. As of March 28, 2018, the company operated approximately 7,200 stores across 14 countries. It primarily operates its stores under the GameStop, EB Games, and Micromania brands. The company was formerly known as GSC Holdings Corp. GameStop Corp. was founded in 1994 and is headquartered in Grapevine, Texas. Company description from FinViz.com. Gamestop is headed to the same fate as Blockbuster. Gamestop sells preowned game consoles and video games. With Google announcing Stadia where all games are browser based and run on any device and computing power is not important, this is a major hurdle for Gamestop. Microsoft announced a similar fate with plans on moving the Xbox to the cloud, called Project XCloud, and there will be no game consoles or game CDs. With these two giants eliminating the hardware and software that is resold by Gamestop, this company is in a world of trouble. They do sell other products but consumers come into their stores for the games. With 7,200 stores they have a lot of overhead and their biggest revenue items are disappearing. Granted, this will not happen overnight. These game conversions to the cloud will take months to take hold and many months to become the majority of market share. However, investors will see the future, with Blockbuster a prime example, and Gamestop shares are going to bleed value in the months ahead. Earnings April 2nd. Normally we would not take a position in front of earnings but there will be analyst questions about the path of progress. The answers may be hard for investors to handle. I am recommending we own a put and hold it over the earnings report. Update 4/3: Gamestop (GME) reported earnings of $1.60 that matched estimates but was down from $2.02 in the year ago quarter. Revenue declined from $3.32 billion to $3.06 billion and missed estimates for $3.28 billion. Even worse they projected a 5% to 10% decline in revenue in 2019 and losses of up to 5 cents per share in Q1. The company is struggling to adapt to changes in the video game industry. Microsoft has announced a new Xbox game console that only uses downloaded games. That prevents users from reselling the games to Gamestop on CDs as in the past. Apple and Google also announced new video game offerings that stream games through your browser and the game does not reside on your computer or mobile device. That means no CDs and no consoles needed to play the games. That means no resale opportunities for Gamestop. This is also going to impact the resale value of existing games and consoles. In addition to their woes, Activision Blizzard announced today they were going to release a battle-royale version of Call of Duty that would be free online in the month of April. Shares fell below $9 at the open but rebounded sharply in what should be a dead cat bounce. Update 4/6/19: After the disappointing earnings Bank of America reiterated an underperform (sell) with a price target of $5. However, Telsey Advisory reiterated a market perform and a $10 target. The stock closed at $9.86. Long May $10 put @ 65 cents. see portfolio graphic for stop loss. 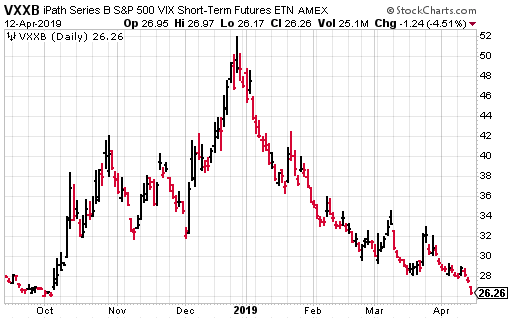 A big break below 28 and a new 6-month low.